When it comes to dry cleaning, many people view this service is “unnecessary”. However, this is far from the truth. While we offer 24- hour self-service machines here at SoapBox Laundry, we encourage you to read up on some of the benefits of dry cleaning and how it could help elevate your laundry routine. 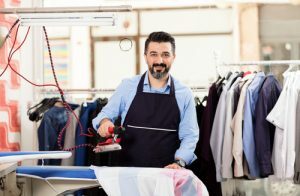 The dry cleaning professionals at SoapBox Laundry use their expertise to divide your garments that contain stains into two categories: solvent soluble stains and water soluble stains. Our experts are then able to effectively treat your stain. At times, trying to tackle these stains at home can be a grueling process. Often times, the stain can become worse if not treated properly the first time. Also if you fail to remove the stain completely and dry the garment, it could oxidize and turn the spot yellow or brown. With basic cleaning, you may not be able to eliminate all of the odors that absorb into your clothing. If you have had any garments affected by water or smoke, they may have odors that become embedded into the material. However, utilizing dry cleaning services can help keep your clothes smelling great at all times. Whether you’re tackling a small load of delicate fabrics, or a commercial size load of towels, dry cleaning services are perfect for you! 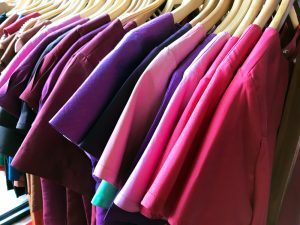 With a wide range of expertise, our dry cleaning professionals can help you take care of one item or handle an entire hospitals stock of sheets. The possibilities are nearly endless, and no job is too big or too small for the SoapBox team to handle. One of the great things about dry cleaning, it the convenience it provides. 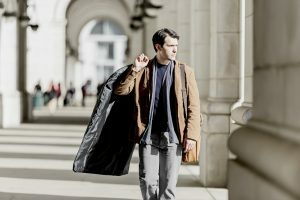 With pick-up and drop-off dry cleaning, you don’t have to worry about taking time out of your day to tackle those tough stains or steam your dress clothes. It could take you up to three hours to launder all of your garments, and after a hard days work, that is not something you want to deal with. You can save so much time by leaving the laundering to the professionals of SoapBox. Sometimes your laundry needs may be more than you can handle on your own. Even if you think you can take care of things on your own, it’s always great to save some extra time and energy! Leave the hard work to the professionals and enjoy the extra time you save by using dry cleaning services. Give us a call today at 267-393-2105 to take advantage of our Pick-up and Drop-off Dry Cleaning services! Lace and Silk may look great in theory, but the way you wash these delicate fabrics could be the reason for your next fashion disaster. At SoapBox, we have laundry experts who are here to give you the best tips for treating all of your most sensitive items. Before you start hand washing the brand new top you just wore out over the weekend, be sure to check the tag (often inside the garment on either side). To keep your silk top looking sleek and chic, you may want to dry clean for the best results. To ensure you’re treating your delicate items in the best way possible, be sure to always verify the treatment before you start washing the item. For all of your delicate items that can be placed in the washer, it may be a good idea to invest in a mesh washing bag. Washing delicate items in a garment bag can help prevent the fabrics from snagging on any type of button or zipper. Some added protection for your delicate items? Turning your items inside out before placing them in the bag than be a huge help. A washing bag also helps to keep different fabric types from tangling up. Silk is a difficult fabric to treat because of how delicate it is. Almost all silk clothing will have a tag specifying that it should be dry cleaned. For the best results, silk should be handled by the professionals. If taking care of your delicate clothing items is causing you stress, contact the experts at SoapBox Laundry! We offer expert Dry Cleaning & Alterations Pick-Up & Drop-Off Services, 24/7 Wash/Dry/Fold Pick-Up & Drop-Off Services and 24/7 Self-Serve Laundry. Contact us today so we can get started! Your Winter Jackets Keep You Warm, Make Sure You Keep Them Clean! Jackets get a lot of use during the winter, but if wear and tear is showing, it’s time to give them a good cleaning. However, down jackets require different cleaning than wool coats, and fleece fabrics certainly don’t have the same needs as leather. 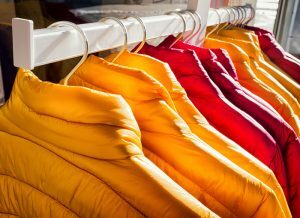 Unsure of how to clean your many different winter coats and jackets? SoapBox’s laundry experts have come up with tips on how to clean the most common winter jacket fabrics, so you can be warm—but look cool—all winter long. Down jackets and vests are very fashionable for the winter months, but there’s a misconception that they’re hard to clean. While you should always read the care label on each of your down items. They can generally be washed in a front load washer—just be sure to use a detergent specifically made for down garments. For drying, a low heat setting should fluff it to perfection. If you’ve heard too many horror stories about down garments getting ruined after a home-wash, our professional drop-off laundry services are the perfect option. Wearing fleece is possibly one of the coziest perks of winter. However, washing them incorrectly can roughen up their snuggly appeal. To avoid this, wash your fleece items in cold or warm water on your washer’s permanent press cycle. This ensures it won’t spin so fast that your items get wrinkled. To prevent pet hair and lint from ruining your fleece’s fluffiness, be sure to wash with other clothes that don’t produce lint. Although you can tumble dry fleece on a low heat (never on high! ), air drying is the best drying method. Warm and tailored, wool coats are a classic winter staple. However, because most wool coats are lined with non-washable fabrics, they typically need to be dry cleaned (you can find this out on the care label). At SoapBox, we will keep your wool coat clean and structured, with our expert dry cleaning services. While leather items don’t get tossed in the washer and dryer, but like your other jackets, they get dirty. To keep your leather looking sleek, spot treat any stains with leather-cleaning products and a damp cloth. Feeling a little nervous about cleaning your leather jacket? Allow our experts to use our professional products and equipment to remove stains while also ensuring the leather stays looking lush. If cleaning your winter jackets and coats makes your nervous—or if you simply don’t have time—drop-off your items with the experts at SoapBox Laundry! With our drop-off dry cleaning and Wash/Dry/Fold services, your winter outerwear will be expertly cleaned and well taken care of—we guarantee it’ll be the easiest thing you do all winter. Contact us or drop off your items with us today! Don’t Let Stains Ruin Your Holiday Spirit! The holiday season is upon us! With all the running around and chaos, accidents and stains are bound to happen. From spilled wine to gravy splatters, there are many types of stains you could encounter. However, knowing how to remove these stains will keep you from going crazy during the holidays. Thankfully, the laundry experts at SoapBox Laundry have come up with these stain removal tips for some of the favorite holiday foods, so you can have your pie and eat it (or accidentally drop it), too. Wine stains can appear on various materials. If wine spills on a furniture cushion, blot up as much as you can and treat the fabric with an upholstery cleaner. When the holiday is over, (and if it’s movable) bring it to SoapBox so our dry cleaning experts can work their magic. 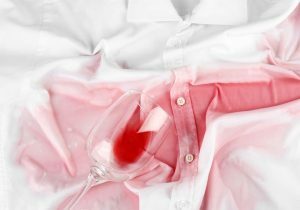 If you get a wine stain on clothing (it happens to the best of us! ), soak the garment in cool water. Then treat it with a stain remover and toss it in the washer on the hottest water safe for your garment’s fabric. Whether you’re cooking the turkey or just enjoying it at the dinner table, turkey grease has a way of splattering on to fabrics. For light grease stains, pre-treat the spot by spraying stain remover or rubbing it with detergent booster or liquid laundry detergent. For heavy duty grease stains, lay the item face down on top of clean paper towels and apply cleaning liquid on the back of the stain. Just be sure to replace the paper towel often. Let your garment air dry and then rinse it in the hottest water that your item can handle. You may have made it all the way to dessert without even a crumb dropping, but pies can be the nemesis of even the neatest eaters. If you find yourself wrapping up dessert with a stain, blot the spot dry. 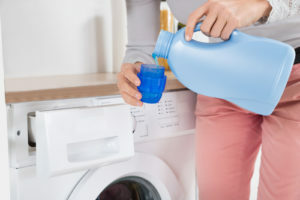 When you get home (or when your guests leave), read your garment’s label to find out the hottest water in can be washed in and then toss it in the washer—just be sure to avoid using soap. A general rule of thumb for most stains? Act quickly and remember to always blot—preferably with a white cloth or towel—never scrub. If you need a little further assistance, stop by SoapBox Laundry today and we’ll be happy to help! We all have had days where there just wasn’t enough time to get all our chores done. Luckily, the experts at Soap Box Laundry are here to help when it comes to your laundry needs. 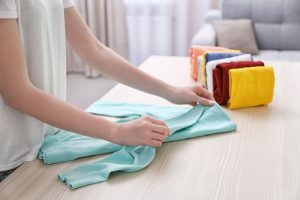 Let’s take a look at a few ways you can save time when it comes to your laundry needs, allowing you time to check other items off your list. 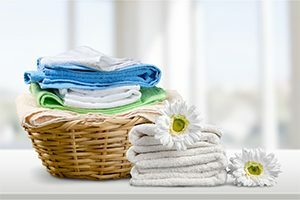 Organization– Having a laundry system in place can make a huge difference on laundry day. You can stay organized by pre-sorting your clothes or by setting up a laundry schedule for the entire family. Setting up a schedule allows you to consolidate loads, which is a huge time saver! Check Pockets – Before throwing clothing in the washer, clear the pockets to keep your load free of any stray tissues, pens, or even worse, gum! Missing these small items that can be hiding in your pockets can cause a major mess or even ruin some of your favorite clothing. No one wants to take the time to remove gun from their favorite jacket! Take Advantage of Drop-off Services– While multi-tasking is manageable at times, you can’t be at multiple places at once. That’s where we come in! We offer the highest quality wash, dry & fold drop-off services so you know your laundry is taken care of! Eliminate Ironing– Irons can be a hassle to store and set up. They may get those wrinkles out, but why not stop wrinkles before they happen. By removing your clothes from the dryer quickly after completion, you can prevent those pesky wrinkles from setting in. Soap Box Laundry is always here to assist you with all your laundry needs. 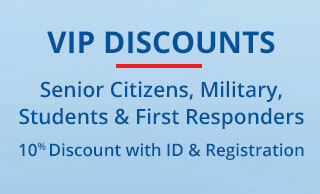 Plus, we provide services that can be utilized 24-hours a day, 7 days a week! If you have any questions about our services, be sure to contact us via our website, or give us a call at (215) 551-1190. Don’t let your clothes sit in the dryer. Folding your clothes shortly after they are dried gives you less ironing to do in the long-run. If you don’t have time to take them out of the dryer right away throw a damp towel in and run the dryer again for 15 minutes to avoid wrinkles. Shake your clothes out. This may seem trivial, but shaking and smoothing your clothes before folding them has a lasting effect. This will especially help your towels, as this will help keep them fluffy. The fabric of your clothing decides whether it should be hung or folded. If it’s a slippery material such as silk, it may be better hung. However, sweaters and cotton clothing can be folded without the risk of creasing. Some clothing requires extra care, so it is important to be cautious when it comes to folding. For example, bras are expensive, and the cups can get easily ruined over time. Folding one cup inside of the other is a no-no and can distort the shape. You can avoid the padding getting ruined by nesting your bras inside the other like in the stores. Contrary to popular belief, rolling your socks into a ball can actually ruin them. Doing this stretches out the elastic, instead put the two socks together and fold them in half. Soapbox Laundry is always here to assist you with all your laundry needs. Our facility is open and attended 24/7, so stop by when it’s convenient for you! If you have any questions about our services, be sure to contact us via our website, or give us a call at (215) 551-1190. Approximately one third of our lives is spent in bed, assuming the average amount of sleep per person is 8 hours. It is important to make sure that you keep your bed sheets clean if you spend that much time in them. We’re not saying wash your sheets every time you do your laundry, but washing your sheets once a week will make a huge difference. Here is some information on why washing your sheets is important! Bacteria and dust mites can accumulate if you do not wash your sheets often. This can cause you to wake up with a stuffy nose, make your allergies worse or aggravate asthma. Sweat and oils spread on your sheets every time you lay on your bed. Did you know that humans produce 26 gallons of sweat in bed each year? Watch out for stains! If you see one, try to treat it right away. Don’t use too much laundry detergent. Do NOT wash in cold water, make sure the water is hot. Use the correct washer setting for your sheets. Soap Box Laundry is your place to go for all things laundry related. Our facility is open and fully attended 24/7 for your convenience. If you have any questions regarding our services, give us a call today at (215) 551-1190. Now that the warm weather is finally here to stay, it’s time for cookouts, beach trips and sometimes, yard work. With the warm weather comes those messy summertime stains, but Soapbox Laundry is here to help! Here are a few common stains that you might encounter this summer and how to get rid of them. Do Not: Use chlorine and oxygenated bleaches, they can make the stain worse. Tip: Try to find a sunscreen that does not contain avobenzone, which is a chemical found in sunscreen that causes your clothes to turn yellow. Tip: Make sure you wash the item of clothing separately with laundry detergent. Tip: Try treating the stain as quickly as possible. The longer you let it sit, the harder it will be to remove the stain. Summertime stains can be frustrating, but Soapbox Laundry is here to help with all your laundry needs! We are open 24/7 and there is always an attendant on staff to help. If you have any questions, feel free to give us a call at (215) 551-1190. Moderation is vital for many aspects in life, from eating to spending money. The same can be said for your laundry. Too much water can flood the machine and too many clothes can overload a dryer. However, let’s not forget that too much detergent can ruin your clothes. Don’t worry, Soapbox Laundry is here to offer some helpful tips on using the proper amount of detergent.